The UniNet iColor LED laser transfer printers are extremely versatile approaches to digital decoration. They excel at everything from decorating dark garments to printing white graphics on black and colored card stock. One of the keys to the iColor’s versatility is the range of self-weeding laser transfer papers available. Different papers support different applications. Since there are so many people interested in decorating drinkware, this is a good time to focus on one of the iColor’s overlooked applications. 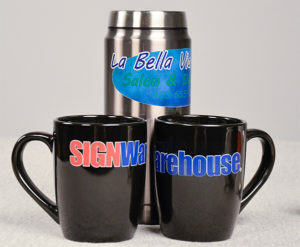 Laser transfer mug decoration offers significant advantages over sublimation and even vinyl. When coupled with an EnduraPRESS MP5 mug press, an iColor printer is a simple yet versatile approach to a booming market. 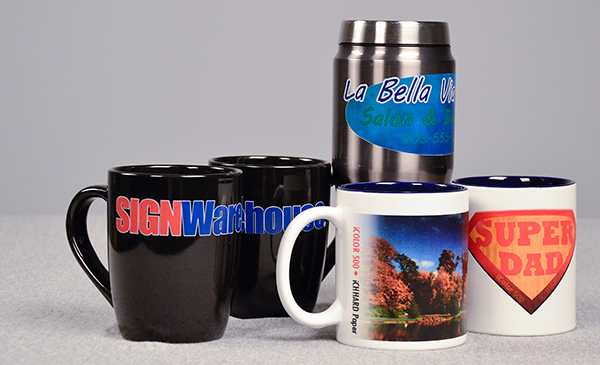 Here’s how to use an iColor laser transfer printer to decorate mugs and tumblers. Just in case this is the first you’ve heard of the iColor printers or laser transfer, here’s a brief overview. The iCOLOR 500 and 600 are LED laser printers that use five specially designed toner cartridges to print to special self-weeding laser transfer papers. These papers can be used with a heat press to transfer images directly to various substrates including fabric, and hard surfaces. The iColor printers can also print to standard papers, films, and card stock which makes them extremely versatile. For a more comprehensive look at the iColor printers’ unique capabilities, please click here, grab a cup of java, and settle in for our iColor Webinar. So what do you need to use your iColor printer, into a marvelous mug machine? Well, in addition to the printer and mugs, all you need is a mug press, some iColor ICHHARD hard surface transfer paper, heat tape, and a convection oven. And water. The iColor TransferRIP which comes standard with the iColor 600 and is optional with the 500, will make decorating colored and stainless steel mugs easier and more efficient, but if you don’t have the RIP, don’t sweat it. You’re still in business. Before we jump into the How, we should probably talk about the Why. There are lots of other ways to decorate drinkware. You can use a vinyl cutter for spot color decals, you can use a printer and cutter for full color decals, and you can use dye sublimation for full color transfers. We covered all of these methods in detail in our Decorating Drinkware webinar, which is also online at SignWarehouse Television. 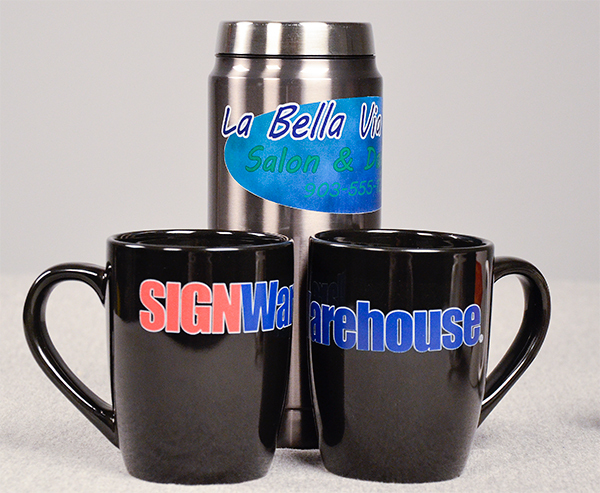 Why use a laser transfer process for decorating mugs? Fig 1: The iColor system supports decorating dark and un-coated mugs. Laser transfer offers several unique advantages. Compared to basic vinyl decals, it offers the added impact of full color and photographic elements including faces, logos, gradient color, fancy fills and more. Compared to large format print and cut decals, it offers the simplicity and efficiency of self-weeding paper. No need to contour cut the image, then weed the decal. Just print, press and peel. Compare to sublimation, the iColor’s advantages are the same as with fabric. Laser transfer can decorate un-coated materials, which are more readily available and less expensive than polymer-coated mugs. And since the iColor system includes white toner, you can apply opaque colored images to mugs of any color, even black. You can’t sublimate an un-coated black ceramic mug from the dollar store. The iColor can do all of this and more (Fig 1). With an iColor and an Endura mug press, you can greatly expand your creativity, broaden your product offerings, and improve your profitability. Process: Print Press, & Peel. Enough about Why. Here’s how it works. Load appropriate toner set for the color of your mug. For decorating white mugs, use the CMYK toner set for full color and rich, opaque blacks. If decorating dark mugs or stainless steel tumblers, select the CMYW profile. • Print on ICHHARD paper using the Labels 2 media type setting. Load the paper in the Multi-Purpose Tray plain side up. • Cut the paper to fit your mug. You can of course, print several copies of one design on each sheet of paper. Attach the paper to the mug or tumbler with piece of heat tape. (Tip) Placing the tape behind printed areas of the paper may cause defects, so place it on the back of un-printed areas if possible. • Set for 3 minutes at 300° F. Adjust pressure on the MP5 by turning the thumb screw. Turn it clockwise to reduce pressure; counterclockwise to increase it. Pull the lever all the way forward to close and lock the press. Press the little red button on the side to start the timer. Fig 2: Peel it warm, along the surface of the mug. There should be a little resistance. • Peel. The ICHHARD paper should still be a little warm and offer some resistance. 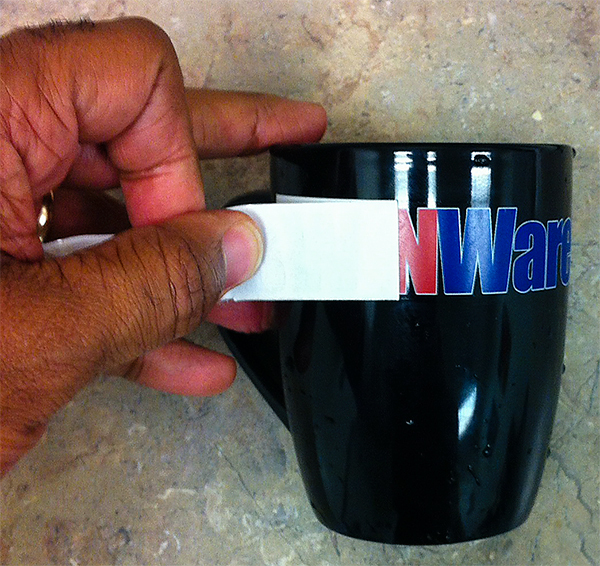 Remove the heat tape, and starting at one edges, peel the paper back along the surface of the mug (Fig 2). • Almost done. The mug is now ready to use, but, to achieve optimal abrasion resistance, the toner needs to be cured. Place in convection oven at 360° F for 20 minutes. Care, Concerns, & Creative Possibilities. Is it dishwasher safe? No. Like most digitally decorated mugs, hand-washing is recommended. Can you add vinyl? Yes. An ultrametallic vinyl like Endura GlitterCAST would be a great accent to a printed transfer and add some sparkle and value. You can design your graphic in layers, send the print layer to the iColor printer and the accent layer to your vinyl cutter. Apply the vinyl decal around or over the toner. Since vinyl isn’t designed to be oven-baked at 360°, the best time to add the metallic accent is after you’ve completed the laser transfer and cured the toner. Likewise, mugs with plastic handles or bases aren’t suitable for this process. The plastic parts may melt in the oven. If you have an iColor and are ready to add mugs to your laser transfer repertoire, click here to purchase an EnduraPRESS MP5 mug press. If you don’t already have an iColor and are ready to start your drinkware decoration business, click here to order an iColor 500 starter package with an EnduraPRESS MP5 mug press and the essential software and supplies. Got questions or cool laser transfer ideas for mugs and tumblers? Feel free to drop ’em in the Comments below.